The District of Yambol is just one of Bulgaria’s 28 administrative districts. It has a territory of 3335 square kilometers. All of the newly found archaeological objects in Yambol District have been included in the “Archaeological Map of Bulgaria", an electronic system featuring sites from the 8th-7th millennium BC to the 16th century AD with photos and GPS coordinates, which are really helpful in prosecutions against treasure hunters. The 87 newly discovered archaeology sites in Yambol District are mostly burial mounds (tumuli), Bakardzhiev has told Radio Focus – Sliven. But they also include one previously unknown dolmen – a single chamber megalithic tomb – located near the town of Stranzha. Bakardzhiev explains that in 2014 the Yambol Regional Museum of History conducted excavations of a number of archaeological objects, with the Bulgarian Ministry of Culture providing funding for the excavations of two sites – the Ancient Thracian city of Kabile and the “Little Fortress” near the town of Voden close to Bulgaria’s border with Turkey. 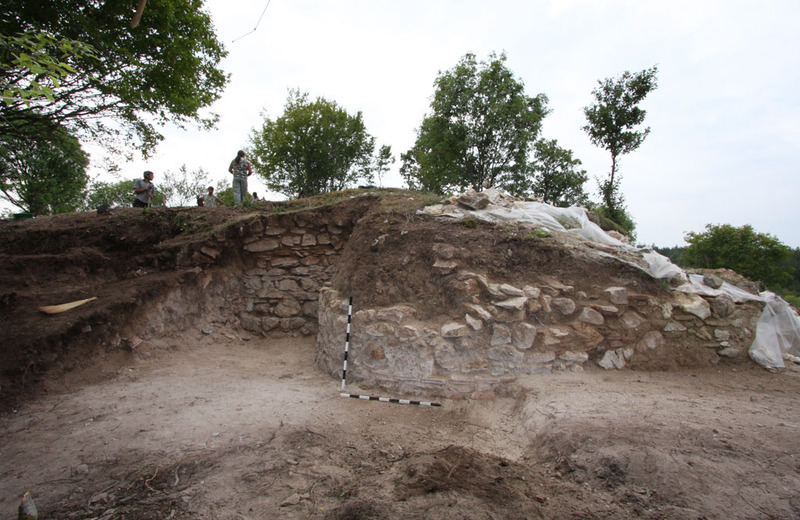 The excavations of the medieval Bulgarian / Byzantine fortress near Voden dating back to the 12th-13th century was funded for the first time by the Bulgarian government with a total of BGN 20 000 (app. EUR 10 200). The Yambol archaeologists managed to excavate half of the inside area of the Voden fortress with this sum. Bakardzhiev also says that for the first time since 1979 the local archaeologists have excavated the prehistoric tumulus located near the town of Veselinovo. In 2014, they also resumed the digs at the Ancient Roman settlement located in an area known as “The Yurt" near the town of Stroyno, Elhovo Municipality. The Roman settlement near Stroyno became famous in 2007 when the team of Bulgarian archaeologist Daniela Agre discovered a stone sarcophagus with unique golden decorations, and ceramic and glass vessels. However, the Ancient Roman site near Stroyno has been ravaged by treasure hunters in the past 10 years, and, in the words of the director of the Yambol Regional Museum of History, it now looks like a battlefield, with over 200 pits dug up by treasure hunters on an area of some 200 decares (app. 50 acres). Several ancient necropolises studied by archaeologists Daniela Agre near Stroyno, Borisovo, and Boyanovo are connected with this Roman settlement, Bakardzhiev says. Speaking at a news conference in early March 2015, Bakardzhiev explained that Bulgaria’s Yambol District is extremely rich in terms of archaeological heritage featuring about 4000 archaeology sites from different ages. The Ancient Thracian city of Kabile is a nowadays Archaeological Preserve located 10 km away for the southeastern Bulgarian city of Yambol. The city of Kabile was founded around 2000 BC, and was one of the most important cities of Ancient Thrace. In fact, it is believed to have been one of the royal residences of the kings from the Odryssian Kingdom, the most powerful state of the Ancient Thracians. In 341 BC, Kabile was conquered by Philip II of Macedon. The Ancient Thracian city is mentioned by 14 ancient authors, the first of whom describes its conquest by Philip II of Macedon. After the collapse of Alexander the Great’s empire, in the 3rd century BC, Kabile was ruled once again by the Ancient Thracians. It was conquered by the Roman Empire in 71 BC, and later was incorporated into the Roman province of Thrace. It was an important regional center in the Late Antiquity as well. The city of Kabile was modeled after the Ancient Greek cities at the time. It boasts a stone acropolis with a unique rock relief of the ancient goddess of Cybele, a protector of the city. In the 4th century AD, Kabile was conquered by the Goths, and was later destroyed for good by the Avars. The Kabile Archaeological Reserve was established in 1965 on a territory of 650 decares (160 acres). It features ancient structures such as the agora (a central square), Roman barracks, Roman thermae, a bishop’s basilica, among others. Kabile is excavated every year by archaeological teams from Bulgaria and abroad. The “Little Fortress" near the town of Voden is located in Yambol District, close to Bulgaria’s border with Turkey. The medieval Bulgarian / Byzantine fortress near Voden dates back to the 12th-13th century. It was excavated for the first time with government funding in 2014. The Ancient Roman town near Stroyno, Yambol District, Southeast Bulgaria, is located in an area known as “The Yurt". It became famous to the general public back in 2007 when the team of Bulgarian archaeologist Daniela Agre discovered there a stone sarcophagus with unique golden decorations, and ceramic and glass vessels. Several ancient necropolises studied by Daniela Agre near Stroino, Borisovo, and Boyanovo are connected with this Roman settlement. After the discovery of a fragment of a Roman Navy veteran’s diploma in 2014, the Bulgarian archaeologists have hypothesized that the Roman town near Stroyno was settled by retired Roman military veterans of Thracian origin. In the past decade, the Roman town has been savagely destroyed by treasure hunters. According to the director of the Yambol Regional Museum of History, Stefan Bakardzhiev, the one-time Roman settlement now looks like a battlefield, with over 200 pits dug up by treasure hunters in an area of 200 decares (app. 50 acres). Treasure hunting and illegal trafficking of antiques have been rampant in Bulgaria after the collapse of the communist regime in 1989 (and allegedly before that). Estimates vary but some consider this the second most profitable activity for the Bulgarian mafia after drug trafficking. One recent estimate suggests its annual turnover amounts to BGN 500 million (app. EUR 260 million), and estimates of the number of those involved vary range from 5 000 to 200 000 – 300 000, the vast majority of whom are low-level impoverished diggers.